The Consumer Electronics Show (CES) is about to open in Las Vegas (it is on from 6 to 9 January) and already a number of automakers are highlighting their innovations that will be on display at the event. One of these is BMW, which explains that it will be presenting a concept vehicle that showcases the kind of lighting innovations we can expect in the future. BMW's Laserlight technology made its production car debut in the BMW i8 and boasts lighting capability up to 600 metres, more than twice that of conventional headlights. At this year's CES however, the system will be on display with its new functionality, such as the ability to be linked up to cameras, sensors and driver assistance systems - all of which, the automaker says, opens up the prospect of numerous new functions in the future. The German company's stand will also feature OLED (organic light-emitting diodes) technology in its vehicle tail lights and glimpses of the potential offered by this innovative technology. Another highlight at the automaker's stand will be its demonstration of the continuance of the collision-free driving technology it initially showcased last year. It explains that the platform for 360-degree collision avoidance is secure position and environment recognition - which is demonstrated it its i3 research vehicle. Four advanced laser scanners record the environment and reliably identify impediments such as columns, for example in a multi-storey car park. If the vehicle approaches a wall or a column too quickly, the system brakes automatically to prevent the threat of collision. The vehicle is brought to a standstill very precisely with centimetres to spare. If the driver steers away from the obstacle or changes direction, the system releases the brakes. This system relieves the burden on the driver in an environment with poor visibility and makes a further contribution to enhanced safety and comfort. The application can be overridden at any time by the driver. 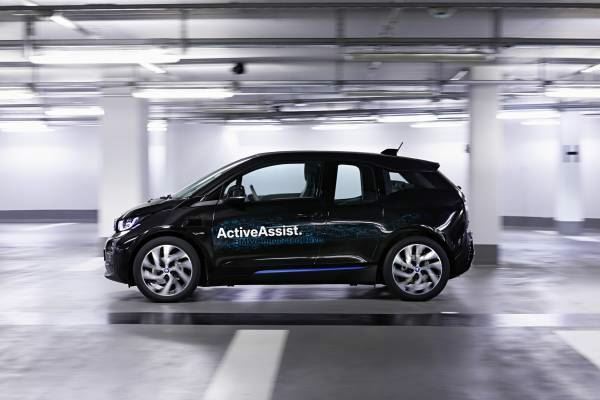 The fully automated Remote Valet Parking Assistant in the BMW i3 research vehicle combines information from the laser scanners with the digital site plan of a building. If the driver uses the Smartwatch to activate the fully-automated Remote Valet Parking Assistant, the system will steer the vehicle independently through the levels, while the driver has already got out of the car and is on his way to a business appointment. It recognises the structural features of the car park and equally reliably steers round any obstacles that appear unexpectedly – such as incorrectly parked vehicles. Once the BMW i3 has arrived at the parking space, the vehicle locks itself and waits to be called by Smartwatch and voice command. The fully automated Remote Valet Parking Assistant then calculates the exact time until the driver arrives at the car park and starts up the BMW i3 so that it arrives at the car park exit at exactly the right time.